Take twenty top kids' authors and illustrators. Give them free rein to take turns creating a zany progressive story. What could possibly happen next? It all starts with a train rushing through the night. . . . Well, actually, it starts when Jon Scieszka, former National Ambassador for Young People's Literature, writes a cliff-hanger episode and passes it on to the next member of a cast of celebrated writers and illustrators, who continues the story and passes it on. And what happens between episodes one and twenty-seven? Think werewolves and mad scientists, a talking pig, plenty of explosions, a blue Star Wars lunchbox, two meatballs, a whole army of villains and varmints, and one just plain bad egg. Not to mention our heroes, eleven-year-old twins Nancy and Joe, raised in a circus, who must find the pieces of a Top-Secret Robot in order to rescue their parents before . . . tick, tick, tick! 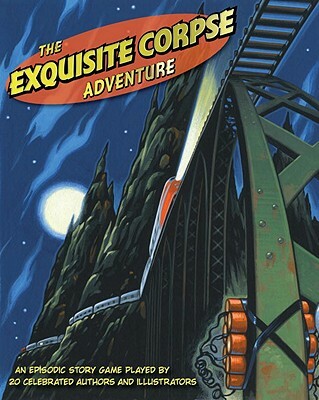 A collaboration between the National Children's Book and Literacy Alliance and the Library of Congress's Center for the Book, THE EXQUISITE CORPSE ADVENTURE originated as a national literacy project for young people and helped launch the READ.gov website.